Measurements: 2.6 x 4.73 inches, or 66 x 120 mm. Back of card: Red outside frame. Lavish, ornate black & green intermediate frame. Inside, two intertwined feathered, winged dragons. May be inverted. An impressive back. Booklet included: Yes, 64 pages, 2.65 x 4.75 inches, or 67 x 120 mm. Instructions in English, French, Spanish, Italian & German. Comments: A dragon deck that makes good use of dragons in their various guises: As fire-breathing, flying monsters, as lizards, as sea serpents. 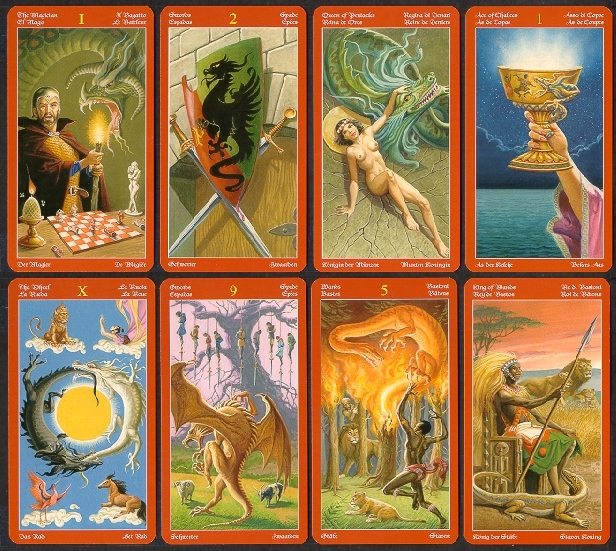 And also as seen by various cultures: Cups are Chinese, Pentacles are Aztec or Incan, Wands are sub-Saharan Africans, with some Hopi details, Swords are Arthurian. Court cards are Infant, Knight, Queen & King. Refreshingly, the cards mean what you think they mean. The keyword for the Queen of Pentacles: Fertility. Give that dragon a cigar!